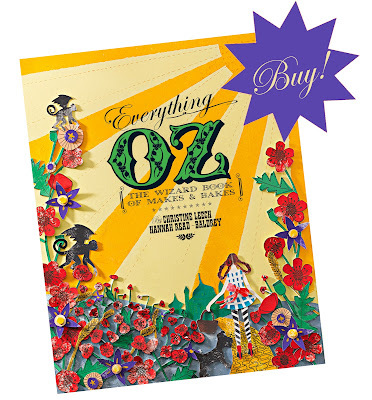 Everything Oz is the much awaited second book in the Everything Series from Christine Leech and Hannah Read-Baldrey. Follow the Yellow Brick Road and get swept along by the cyclone force of Everything Oz, where dreams are brought to life. The classic tale of The Wonderful Wizard of Oz by L. Frank Baum provides the inspiration for this spell-binding and creative collection of 50 makes and bakes, ranging from a Dress-up Dorothy Doll and Toto's Dog Jacket to the Tin Woodman's Heart Garland, Cowardly Lion Hand Puppet and Squashed Wicked Witch Cupcakes. The authors of the ground-breaking craft book Everything Alice, have interpreted this perennially popular tale in their own unique way to create all the projects in this latest book which is filled with yet more original and playful ideas for the eclectic craft lover. Everything Oz is brimming with new and innovative craft projects to eat, drink and wear, so slip on a pair of Sequinned Slippers a walk to the shops to buy this book, because, because, because, because, because - of the wonderful things it does! ©2012 Hannah Read-Baldrey & Christine Leech. All rights reserved. Powered by Blogger.